AKC Champion Alpenschatz gotta have faith! January 23, 2008 - April 5, 2016. (Am/Canadian CH Swiss Stars Legend of Zorro x Am/Canadian CH Octobers Sierra Mist v Alpens) Faith loved people and was oh-so-smart and physically strong! She was a 'singleton' puppy, surprising us by her arrival after the vet said that her dam was NOT pregnant! 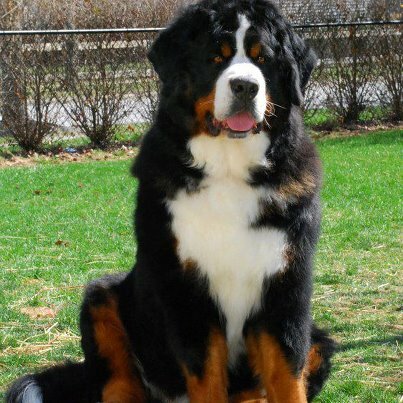 She was a wonderful dam to 3 litters of puppies, breeding and whelping naturally (not always true with Bernese!). All she ever really wanted was to be next to us and soak up all the attention! Though it's never time to say good-bye, she out-lived both her sire & dam by 2 "bonus" years, and her younger 1/2 brother, Gaston, who passed at 7 years old recently. August 3, 2005 - March 17, 2014. Tobie was the longest living of the five puppies born in Annie's last litter. She passed a calm, relaxing life with the Citer family except for one intense bout of motherhood, producing 4 boys and 4 girls under the AlpenSchatz name in 2009. Tobie had a habit of resting with her front paws together, in her 'meditation' pose, which so suited her peaceful temperament. February 20, 2002 - July 15, 2013. Griffin lived a very long healthy and happy life with Rob & Amy and their 4 children and other dogs, spending weekdays in suburbia and weekends in the Catskill mountains running and playing. He lived long enough to see all 4 children off to college and got to teach the ropes to a new Leonberger puppy who joined the family during Griffin's last year. January 26, 2013 - June 28, 2013. Prue was a dearly-loved happy puppy, living with John & Pat, her life tragically cut short by inoperable aortic stenosis, diagnosed at 6 weeks old. August 3, 2005 - March 21, 2013 Our wonderful Murphy led a charmed life with his people Matt and Katie and his co-conspirators Newfoundlands Bella & MoJo. He started life as a Pacific Ocean surfer boy and then migrated inland to the Mid-West. He taught his dad Matt how to cart and do performance obedience in both rally and regular classes,and earned his Canine Good Citizen award - all the while being the most perfect and sometimes goofy Berner boy in mind, body and soul. He is sorely missed by so many! January 26, 2013- February 10, 2013 Pip was a tiny fighter with a will to live who taught me so much about neonatal puppy care. 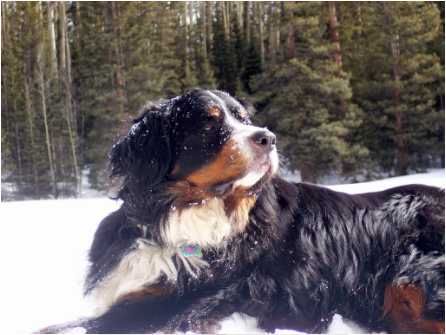 Smokie Bear lived a wonderfully long life on the high slopes of the San Juan Mountains in southwestern Colorado with his family and Berner mates, older Schlappi and younger Valentino. He often visited the Telluride Alpen Schatz Boutique welcoming guests. 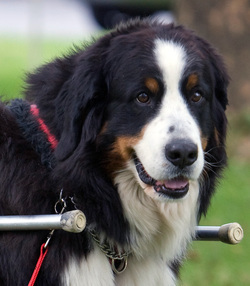 He attended many Bernese National Specialties from coast-to-coast as a greeter for the Alpen Schatz booth. In 2003 and 2011, he showed in the puppy and the veterans classes at Bernese National Specialties in California. Hiking and romping in the snow were high on his fun list. Am. Herding Breeds Assoc. Junior Herding Dog-sheep "Zorro"
Gentle soul with heart of gold. Quietly making his presence known. Hug giver. Foot warmer. Snuggler. Worked his magic with everyone. Cayla was a close relative of our first dog Leia. We purchased her at about a year old and she lived with us and competed in conformation, earning AKC points until a near-fatal sudden illness of unknown origin (necrotizing vasculitis) in 2004 led us to the decision to retire her in 2005 to live with a near-by family with 3 children - one a special needs autistic child. Cayla thrived here with much love and attention, in excellent health for 6 more years until her passing three weeks before her tenth birthday. Divine Bette von AlpenSchatz, CD, RE, NDD, JHD-s, CGC/TDI "Bette"
Divine Bette von AlpenSchatz, AKC Companion Dog, AKC Rally Excellent, BMDCA Novice Draft Dog, AHBA Jr.Herding Dog-sheep, AKC Canine Good Citizen/ Therapy Dog Intl. Bette was the first puppy born in our largest and first litter of 9 puppies. She excelled in obedience and took to agility enthusiastically. She survived a cancerous mast cell tumor removed in 2007 with follow up immune system support. She was the nicest heeling dog I ever trained, put up with carting, and really loved herding, walks in the woods and chasing deer, squirrels or treeing a bear! She was very quiet around the house but relished being outdoors. Alpens Anakin v Liebenhund, CGC/TDI "Annie"
Annie was a sweet, happy dam & grand dam- patient, gentle, and always a lady. She led a long, happy life and produced 12 puppies who all carry her friendly temperament. American/Canadian Champion Octobers Sierra Mist v Alpens CGC "Sierra"
Sierra was a bundle of intelligent energy who was happiest tucked up next to us, strong yet totally gentle. She produced two lovely puppies. Champion Erlo vom Obwaldernof CD, NDD, CGC "Hans"
Hans was a gift from our Swiss friends & imported as a puppy. He was our brave, wise & comical first Berner boy. The picture of him above was given a place of honor as the cover of the 2003 BMDCA Yearbook showing Hans at at 7 years old, bringing me his draft harness to hitch up and pull his cart. Champion Kd's Princess Leia's Ovation, CD, DD, BNDD, CGC "Leia"
Leia was our first Berner. Beyond her conformation and working titles, she was a superb family dog with our young children. She was loved by all who met her. Just recently, a friend remembered how she had natural herding/protection ability on a woodland hike - running from the front to the back of the line of hikers again & again to make sure everyone was OK. Berners really do need a job to do! Leia produced one puppy with Hans as the stud dog. A very young puppy of unknown origin, whom I named " Macky" after R.A.S. MacAllister, an Irish archaeologist digging in Palestine, 1902-1909, was found at the bus station scrounging for food in Ramla, Israel, while i was working at the nearby Tel Gezer archaeological excavation. She traveled to Switzerland, the States, to England for 5 years then back to the States again - my constant companion for almost 15 years. I have never met a dog quite like her - both in wonderful personality and looks. Thus began my adult life with dogs!